I'm definitely waiting on this one. I love paper cut art and am happy to see it showing up on book covers. (See: Unspoken.) I'd be really happy for it to become a trend. I'm excited for Paper Valentine too! Wasn't a fan of Yovanoff's other novel (The Replacement) but this one just sounds REALLY good. <3 Great pick! I'd really like to read this book too!! I'm really looking forward to this one too. Thanks for sharing. Lovely cover, and it really fits the book's title! 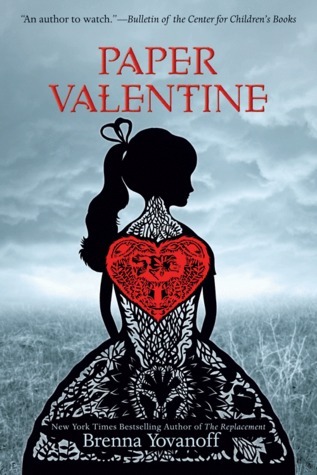 It sounds like it's YA and gothic, and I'm a bit hesitant about that combination. I love Brenna's writing and will definitely be picking this one up as well! This one had me at "ghost girls and horrifying secrets"! Sounds awesome! This does look good and the cover is so pretty and somehow haunting. I'm excited for this one too! I have it pre-ordered and it's my WOW pick coming up reasonably soon.